Slow-moving, dialogue-heavy drama that nonetheless remains engaging thanks to Chabrol's assured direction and a terrific performance from Isabelle Huppert. Loosely based on a real-life case, A Comedy of Power stars Isabelle Huppert as Jeanne Charmant-Killman, a ruthless judge (nicknamed The Piranha) who's assigned the job of investigating a high profile case of corruption and embezzlement in a giant, state-sponsored corporation. When she arrests the neurotic CEO (Francois Berleand), he quickly implicates his superiors and Jeanne realises that the case extends into the upper echelons of government. Meanwhile, Jeanne's obsession with her work begins to affect her marriage to Phillippe (Robin Renucci), especially when the death threats start and she has to have 24-hour bodyguard protection. As the shady government figures resort to ever more dirty tricks, Jeanne discovers that there are only two people she can really count on: her nephew (Thomas Chabrol) and her new associate (Marilyne Canto). 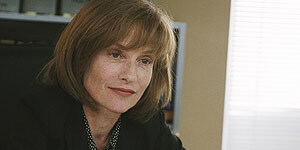 A Comedy of Power is Huppert's seventh collaboration with director Claude Chabrol and she gives one of her best performances to date as Jeanne, whether she's running rings around her various interviewees or stoically dealing with her own troubled home life. It's fascinating to watch Jeanne in action, particularly whenever she dons her bright red gloves. Chabrol is often referred to as France's master of suspense and he doesn't disappoint in that regard, orchestrating some genuinely tense scenes and generating an oppressive atmosphere throughout. Aside from its deliberately slow pace, the film's biggest problem is that it's extremely dialogue heavy and occasionally very dull as a result, particularly as all the shadowy government types tend to blur into one. Despite its misleading title and occasional pacing problems, A Comedy of Power is worth seeing for Isabelle Huppert's superb performance.